…[Christ] honours obedience by His actions, and experiences it by suffering. Just as in our case, the mere disposition is an unsatisfactory thing unless we give it practical effect—for deeds are the proof of dispositions. We may perhaps also make the not invalid assumption that He tests our obedience by the art of His philanthropy, and measures all our sufferings against His own, so that He is able to understand our condition in light of His, taking frailty into account along with suffering, knowing how much can be demanded of us by the one, and how much we are to be excused by the other. For the first time ever, the Ambigua of St. Maximus the Confessor has been translated into English by Fr. Maximus of Simonopetra Monastery. You can order it from Harvard University Press; however, so that Fr. Maximus (the translator) would not be confused with his patron saint, St. Maximus the Confessor (the author), the book was published under Fr. Maximus’ name in the world, Nicholas Constas. To say that I am enjoying this book would be an understatement. Fr. Maximus’ translation is amazingly clear. Up to this point, nearly all that can be read of St. Maximus the Confessor in English is found in Metropolitan Kalistos Ware’s (et. al.) translation of the Philokalia (which, by the way, is also a very good translation). 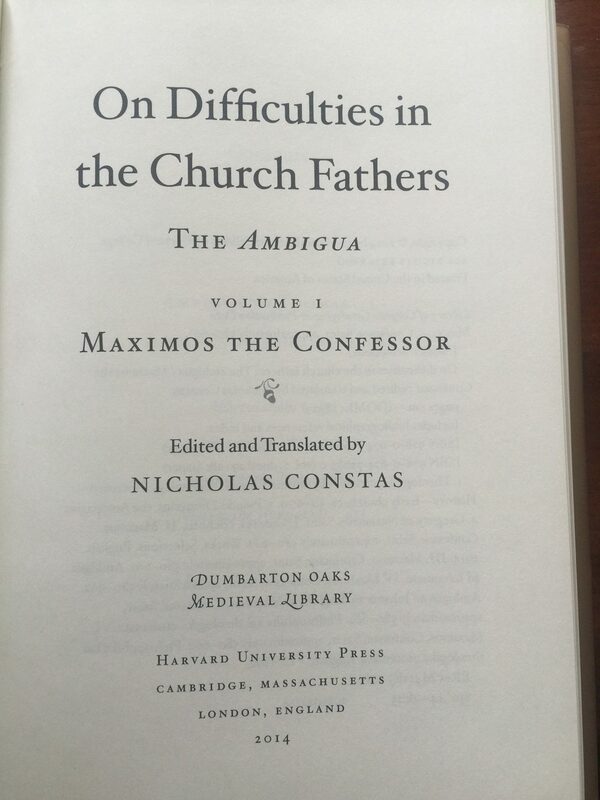 There may be other translations of St. Maximus’ work out there, I’m just not aware of them—Although, I freely confess that I have not looked very hard, so if someone knows of other works by St. Maximus the Confessor published in English and not found in the Philokalia, please comment below. But to return to the text at hand, it is the phrase, “deeds are the proof of dispositions,” that I’d like to look at today. St. Maximus in his commentary on this passage focuses entirely on how Christ could suffer as God in the flesh. However, what I would like to comment on is our merely human experience of what St. Gregory calls our “disposition” and the deeds that manifest that disposition. From the perspective of our corrupted human experience, God asks obedience from human beings. But why? I think what St. Gregory is telling us is that obedience is not so much a measure of our relationship with God, as it is a revealer of our inner disposition toward God. Let me explain what I mean. When we suffer as a result of obedience, God takes into account our frailty and understands our condition and suffering because He Himself has taken on human nature and has suffered as a human being. Therefore, the test or measure of our obedience is not some objective or impersonal standard such as “you either did it or you didn’t do it” or “you have obtained the required level or score to pass the test.” No, not at all. The test and measure of obedience has to do with the disposition of our hearts and minds. You might say that obedience is not about performance at all. Obedience is about disposition, a disposition to follow Christ—even, no, especially, when it involves some sort of suffering or sacrifice or inconvenience on our part. When I don’t get what I want, and I freely choose or accept that for Christ’s sake, for the sake of obedience to Christ’s commands, then I am revealing a disposition to follow Christ, a disposition to be His. Someone might ask then, “If God knows all things, why does He need to test our disposition? Can’t God just know?” Well, I suppose God already knows all things from before the beginning, but God knowing isn’t really the issue. The issue is that God created human beings as spiritual and material beings. All that is human is both spiritual and material. Who we really are on the inside is always manifest, or proven (to use St. Gregory’s word) by our deeds. Therefore, it is not so that God will know what is inside us that our deeds test or prove what is inside us, what our disposition is; rather, our deeds prove our disposition because that is the way God created us. It is the nature of the created world. We reveal our disposition by our deeds because it is what we were created to do, because that is how reality works. For this reason He honours obedience by His actions—becoming by nature a new Adam for the sake of the old—and experiences it by suffering, voluntarily accepting to endure the blameless passions of the human body. For this reason our great teacher [St. Gregory the Theologian] said, “He grew weary, He became hungry, He thirsted, He endured agony, He wept, all in conformity to the laws of the body.” These “deeds” are a clear proof of His “disposition,” and a sign of His condescension to His fellow slaves and servants. As a side note, in case some of you are wondering what “natural, blameless passions” are, St. John of Damascus in his work, On the Orthodox Faith, defines natural, blameless passions as bodily functions and experiences that are beyond the control of our will such as hunger, thirst, pain, even fear and more. All that we humans suffer in this fallen world, not as a result of our own will, these are called “natural, blameless passions” and Jesus experienced them all. However, there is also another aspect to our deeds revealing our disposition, and that has to do with our own healing. We human beings are terribly confused about ourselves. We create personas, pictures of ourselves, who we imagine we really are, and we live our lives convinced and trying to convince others that our persona, our imagined picture of ourselves, is who we really are. It takes a lot of work to keep up our persona(s) because who we really are keeps slipping through into our actual deeds. But if we will receive it, if we will accept the humiliation of our repeated failures to live up to our own ideals, then this can be the beginning of our repentance, the beginning of our salvation. This is what confession is all about. Confession in the church is not about broken rules and penalties. Rather, confession is about agreeing with God that you are a mess. It’s about seeing yourself as you really are. This, in fact, is part of the role of the Holy Spirit in the world: to reveal our sin to us. So many people, when they get serious about their spiritual life, think that they will gradually become better people. They think that starting to pay attention to their souls, to their inner life, will be the beginning of their finally being able to live up to the standards, the moral expectations they have set for themselves, or that they assume God or the church has set for them. However, what they soon find out is the opposite happens. Starting seriously to attend to their hearts, they discover that they are much worse sinners than they had ever suspected. And not just discover in some objective or rational sense, but discover in the way a puppy discovers that she has peed on the carpet: by having her nose rubbed in it. It can be an overwhelming experience leading to depression and despair. However, on the other side, on the other side of the depression or despair is hope, hope in the form of humility. Once we can truly confess, truly accept that we are deeply broken, then we can let go of our false pride and our heretical theological assumption that God loves us based on our performance, based on our ability to “make good choices,” our ability to do the right thing. Once we can humble ourselves and confess, accepting our brokenness, and letting go of the persona that we have guarded for so long, then that very humility itself becomes the first step, the first step on the ladder of divine ascent—to use the famous metaphor of St. John of Sinai. St. Maximus says, “For He [Christ] remained Lord by nature, and became a slave for my sake, who am a slave by nature, so that He might make me lord over the one (i.e., the devil) who through deception despotically lorded it over me.” When we by the Grace of the Holy Spirit see and through humility accept both our brokenness and God’s love for us in our broken condition, then we can begin to experience a bit of victory over the devil, over the one who through deception has acted as lord over me. Now this beginning to be lord over ourselves and over the devil who had deceived us comes in the form of dispassion. God knows how broken I am. He understands “our condition…taking our frailty into account along with our suffering.” Because God became human, God knows from His own experience “how much can be demanded of us by the one [that is, our actual, condition], and how much we are to be excused by the other [that is, our frailty and suffering].” God knows what I do not know. But if I am humble, if I can accept that I will always fail to perfectly manifest in my deeds what is in my heart, my disposition, and if I can accept that God truly loves me broken as I am (and accepting both of these is crucial), then, then I can just be my broken, struggling self, with a disposition to offer in return to God the love that He has shown me. Thankyou- it is such a relief and joy to know that what seems to be my experience as I journey along this orthodox path (2 years in..), is founded in the Truth. The shock and despair of realising that despite my best of intentions, I am so, so much weaker and more sinful than I ever expected- but that this is no surprise to God, and that the freedom, healing and deep peace I am finding in Confession, repentance, and the gift of humility, is actually what I have been searching for all my life. thank you father………..it took me 20 years and some rather painful experiences to discover the “beloved mess” that I am……:-))……it was a shock at first (I was convinced to be an excellent person) and than gradually I began to accept it; only to find myself shocked again by my old self…..and than again and again and again…….and now I’ve come to the point that I’m almost not shocked anymore……..I kinda expect the worse from myself…….but it is always painful. it is very painful and heart breaking to watch yourself failing, and failing again and again…….I’m not sure if the pain and grief comes from pride or from a desire that we want to offer God something better, or mix of both of them………..but maybe, humility (that divine humility that is a gift of the Holy Spirit) comes when you do not feel this kind of pain anymore?…..you’re just at peace with who you are – a beloved mess…I really do not know…….. Thank you, Father. This area is a very big struggle for me. I’ve noticed that a greater apprehension of Christ’s unconditional love is the fruit of a good Confession and good confessor and that when I am able to embrace the reality of Christ’s love for me by God’s grace, there is in those moments significant movement within my heart toward dispassion and peace. I am not able to sustain this very long at all, and unfortunately, it is simply not where I live. Feeling compelled to perform (even against one’s rational convictions about the gracious nature of God) in order to believe oneself accepted by God is to constantly short-circuit the work of grace in one’s life and make dispassion impossible. Nevertheless, I fall down, I get up, I fall down, I get up! . . .